Haykanoush» Restaurant is situated on historic Sharambeyan street, and is part of «Old Diljann Complex. The Restaurant has two floors and can accommodate up to 85 guests. 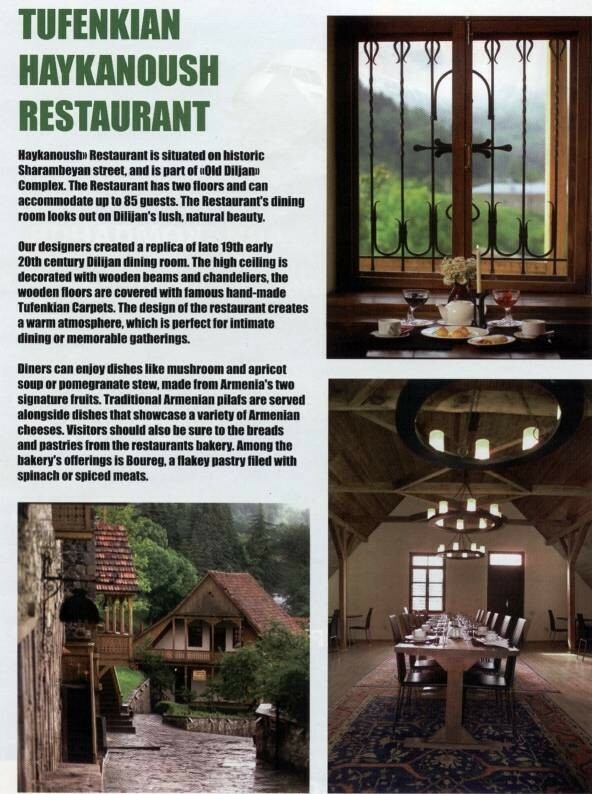 The Restaurant's dining room looks out on Dilijan's lush, natural beauty. Our designers created a replica of late 19th early 20th century Dilijan dining room. The high ceiling is decorated with wooden beams and chandeliers, the wooden floors are covered with famous hand-made Tufenkian Carpets. The design of the restaurant creates a warm atmosphere, which is perfect for intimate dining or memorable gatherings. Diners can enjoy dishes like mushroom and apricot soup or pomegranate stew, made from Armenia's two signature fruits. Traditional Armenian pilafs are served alongside dishes that showcase a variety of Armenian cheeses. Visitors should also be sure to the breads and pastries from the restaurants bakery. Among the bakery's offerings is Boureg, a flakey pastry filed with spinach or spiced meats. Located in an enchanting village on the eastern shore of Lake Sevan, the Avan Marak Tsapatagh hotel features 34 rooms (accommodating 90 guests) including duplexes and suites. 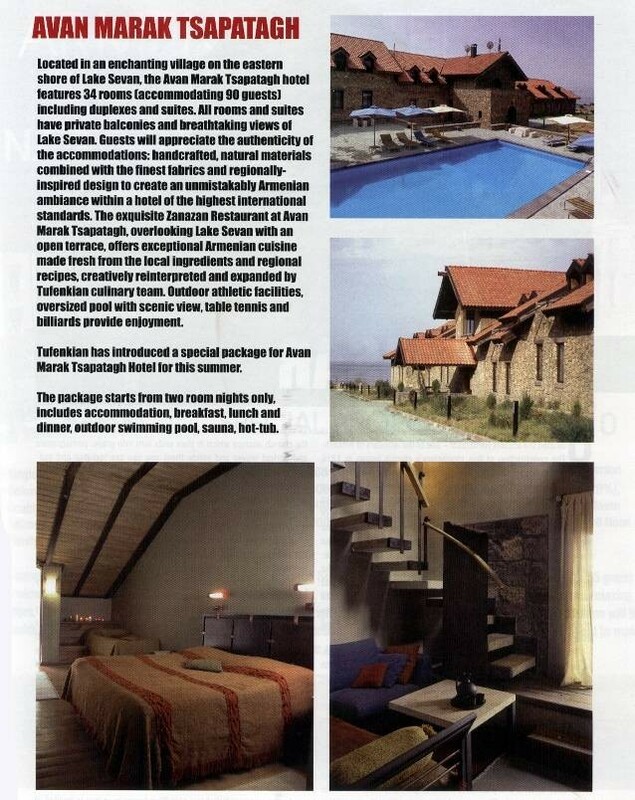 All rooms and suites have private balconies and breathtaking views of Lake Sevan. Guests will appreciate the authenticity of the accommodations: handcrafted, natural materials combined with the finest fabrics and regionally- inspired design to create an unmistakably Armenian ambiance within a hotel of the highest international standards. The exquisite Zanazan Restaurant at Avan Marak Tsapatagh, overlooking Lake Sevan with an open terrace, offers exceptional Armenian cuisine made fresh from the local ingredients and regional recipes, creatively reinterpreted and expanded by Tufenkian culinary team. Outdoor athletic facilities, oversized pool with scenic view, table tennis and billiards provide enjoyment. Tufenkian has introduced a special package for Avan Marak Tsapatagh Hotel for this summer. The package starts from two room nights only, includes accommodation, breakfast, lunch and dinner, outdoor swimming pool, sauna, hot-tub.